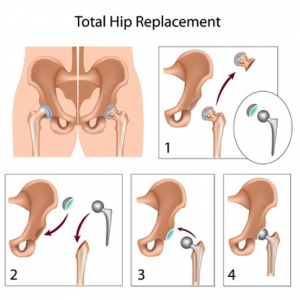 This page contains information about total hip replacement. If any questions remain unanswered please ask your doctor or specialist. Several states of joint damage which cause pain and stiffness are defined as arthritis. Osteoarthritis is one of the most common forms which causes on-going deterioration to the joints. Some forms of this condition also cause soreness and swelling. In time arthritis can cause cartilage and joint damage. Successful total hip replacement surgery can provide reduced pain and more mobility. Pain killers, i.e. paracetamol, and anti-inflammatory pills, i.e. ibuprofen, can help reduce these two conditions. Dietary supplements taken on the advice of your doctor may also offer some relief. Walking aids, from walking sticks to shoe-risers, can help with mobility which is important because keeping moving reduces stiffness. Steroid injections into the hip joint may also be offered to help reduce symptoms. Unfortunately, as the arthritis gets worse, none of these treatments remain as effective. Using one of several anaesthetic techniques, a surgeon will access your ball and socket joint via a cut in your side. The damaged joint will be replaced by an artificial one. The artificial hip implant may either be a metal stem and metal acetabular cup with ceramic on ceramic bearing, or a metal stem and metal acetabular cup with polyethylene (hard plastic) lining. The new artificial hip may or may not be secured with acrylic cement depending on age, bone quality and consultant preference. Using an acrylic cement or a special covering on the new ball and socket joint, it will be bonded to the bone. This procedure is usually completed within an hour to an hour and a half. Hospital recovery is expected to take three to seven days. Once discharged, you will still need to use crutches or similar for a short while. Regular exercise will ensure the best recovery but do consult your doctor about the type of exercise. This type of surgery experiences good success rates and patients are likely to feel less pain and enjoy better movement. You are still advised to take care of your new hip because, like real hips, they will eventually show signs of wear and tear. Whilst there are some obvious causes for hip joint arthritis (injury or rheumatoid arthritis), sometimes no obvious reason is present. Total hip replacement can relieve sufferers of pain and mobility problems.